There are a few other cord-cutting blogs out there. Maybe you read them. I do. I don’t think of them as competitors. I think of them as different points of view. But occasionally one of them is wrong. While I don’t want to single anyone out, I think it’s important to put good information out there so that cord cutters can make good choices. Antenna reception at 150 miles? 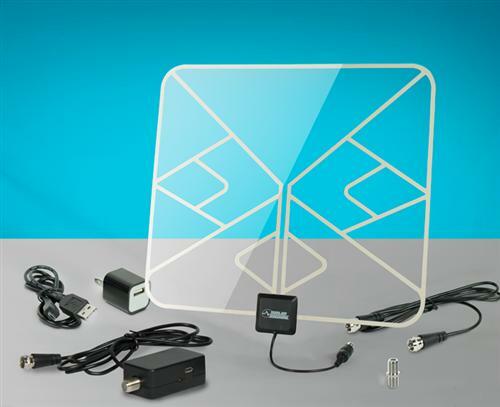 There’s a site out there advertising one of those compact antennas that promises 150-mile reception from a device not much larger than a small wastebasket. You’ve probably seen these things on other sites. They look very scientific with plenty of loops and rotors and even a remote control that looks very fancy. Only problem is, it doesn’t work. Or at least, it doesn’t work the way they say. These fancy little antennas work as well as any other fancy little antenna. They may not be as durable or well-made but they’ll work for you for a while. They’re also not that expensive and they don’t take up a lot of space. But that claim of 150 mile reception? That’s hogwash. Broadcast signals get weaker as they get further away. Digital signals get to a point where they are too weak to rise over the “noise” that’s always there. At some point the curvature of the earth blocks the signal. No reputable manufacturer is going to tell you that reception is possible further than 75-100 miles and the core reason is something called “the shelf effect.” If you don’t feel like diving into another longform article, here are the basics. Digital signals are designed so either you get reception or you don’t. When you reach that threshold, the signals go away very quickly. In most cases that threshold is about 50-75 miles, and there’s a good reason for that. The good reason? In most cases there’s another, stronger signal that comes from a closer city. Even in cases where you’re in the middle of nowhere, you’re dealing with broadcasters whose ad revenue is only measured in the 50-75 mile area they are supposed to cover. There’s no reason they would want to bump up their power so you could get reception. What about those people who say they get great reception? Most of them are either lying or exaggerating. That’s right, people on the internet lie or exaggerate. I’m sure you’re amazed to hear that. For those who do get really good reception in areas where they shouldn’t, it’s often due to some very special feature in their area. For example, Southern California’s miraculous reception comes from its geography — it’s really just a big bowl — and from the fact that TV signals bounce off the smog. In other areas, signals can bounce off mountains. Cities in the middle of the great plains can put towers up high and reach a large area without anything blocking that signal. There are always going to be those miraculous pockets of good signal. Just because someone on the internet claims they can do it, doesn’t mean you can do it. Also, that person may be able to tolerate problems that you wouldn’t. They may not care if the picture freezes for 15-20 seconds every so often. You wouldn’t want that, but maybe they’re fine with it. You don’t know their situations. If you want to delve into some other scenarios, here’s another longform article I wrote about that. So what should you really expect? With the right antenna, almost anyone should be able to get great reception from 50 miles. Most people, with the right setup, should get the reception they want from 75 miles but it might take some extra hardware like an amplifier or tall mast. At 100 miles, luck plays a big part in the equation. If you really want to get the best antenna for where you live, don’t just rely on some cord cutter blog that hawks a weird-looking antenna. Call the experts at Solid Signal at 877.312.4547. If you’re shy, fill out our free antenna request form and you’ll get an email report with everything you’ll need. Will Bent Antenna Elements Affect Your Reception?